So I tried cooking a second recipe from Essential Cooking Basics: The New Cook by Mary Berry & Marlena Spieler (1997), and sadly, I wasn’t nearly as happy with the recipe as last time. 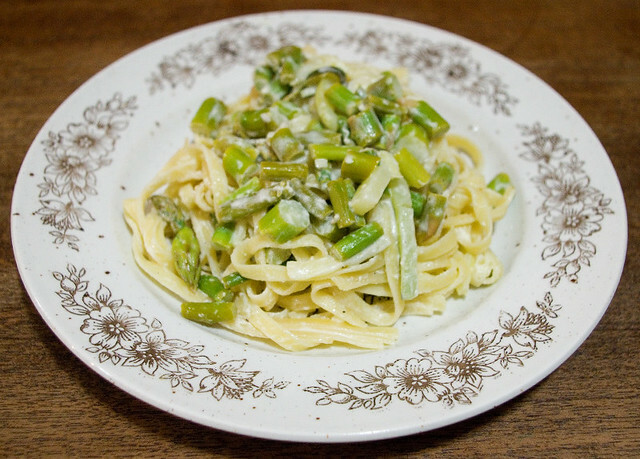 I’ll say up front that I did make a few changes; instead of string beans, I used asparagus stalks cut small, and instead of dried penne I used dried linguini. But I’m pretty sure that’s not where my issues with this dish lie. At any rate, it still holds true to the dish’s basic composition of “the combination of lightly cooked vegetables and pasta”. To be clear, it’s the dish, not the recipe, that I had problems with. 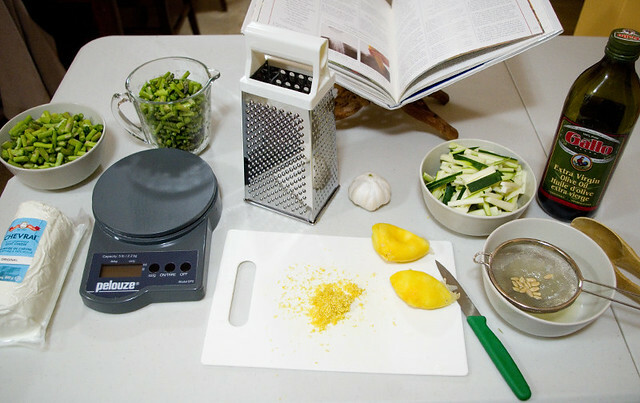 The recipe was quite clear, concise, and yielded exactly the results that it promised. But I’ve had pasta primavera before, and this just didn’t live up to my (admittedly high) expectations. I’d expected the sauce to be creamy, and while it looked like it should be, it really tasted quite dry. That might have been the fault of the cheese that I chose (Chevrai Original Goat Cheese), but it was soft goat cheese as the recipe dictated. Also, the strong flavour of lemon (which my husband insists tasted more like lime, but as you can see from the above photo was definitely a lemon) was off-putting. It’s too bad, because I like the concept behind this dish, but I don’t think that this recipe is for me. That’s all right, since a quick perusal of my bookshelves yielded three different pasta primavera recipes for me to try: on page 327 of the Joy of Cooking (Rombauer & Becker, 2006 edition), page 125 of The New Canadian Basics Cookbook (Carol Ferguson, 1999), and page 164 of Gordon Ramsay’s Healthy Appetite (Gordon Ramsay, 2008). I figure that, with a bit of experimentation, I’ll find a recipe that my husband, kids, and I like well enough for it to become a family classic.